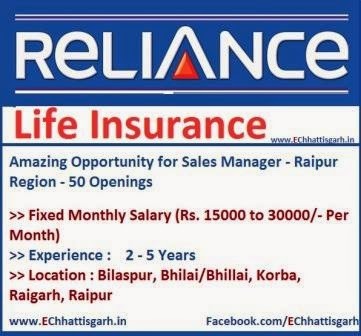 Reliance are hiring young & enthusiastic sales professionals on direct payroll for SALES MANAGER - AGENCY positions across Raipur Region Raipur, Bilaspur, Ambikapur, Korba, Manendragarh, Raigarh,Dhamtari, Durg Bhilainagar, Jagdalpur. Must be a local resident for at least 3 yrs and be well versed with local language. Possess at least a bike and a mobile. Candidates from Pharma, Credit Card, Mutual Fund, Telecom, Home Marketing, FMCG, Insurance, Post Office Agents will be preferred. Good relationship management skills and pleasing personality.